High Low Dresses are dresses that are shorter in the front and longer in the back. Some people refer to them as mullet dresses! But make no mistake about it- these dresses are classy and sophisticated! While there are many different variations, high low dresses often have an above-the-knee length in the front and then cascade down creating a midi or maxi length in the back. One of the things we love most about high low dresses is that they can work for both semi-formal and formal events! If you're wondering whether you'll be too casual in a mini dress or too formal in a maxi dress- opt for the best of both worlds with a high low dress! This cut and style is perfect to wear to weddings where the dress code is ambiguous. The flowy cut and style also makes them perfect for dancing and twirling the night away! Sometimes a maxi dress may feel too heavy and dramatic for a fun party, but you still want to dress appropriately. This is when the high low dress is the perfect choice! High low dresses are the perfect option to wear to parties and weddings. They are also a great option for school dances like homecoming and prom. Choose a high low pencil dress for a great workday look with heels. There are also some great casual high low sundresses that are perfect for those warm summer days and vacations! 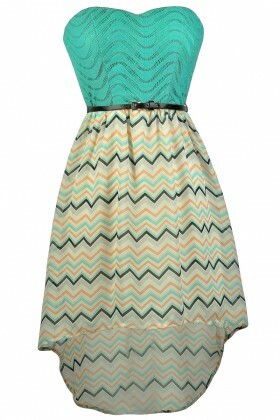 Check out our selection of cute high low dresses and you're sure to find what you're looking for! Free shipping over $75 within the US.